Tasting Notes: Soothing and restful, with chamomile in abundance. Delivers a refreshing light finish. Ingredients: Chamomile, Rooibos, Lemon Balm, Lemon Verbena, Linden flowers, Anise, Cinnamon, Oat Straw, Hops, Passion flower, Orange peel. As far as states of being go, serenity ranks right up near the top of what we as human beings aspire to. For some it’s a walk in the woods, taking the air while birds call from the trees. For others serenity is found within – a calming of the spirit. Throughout human history many have tried to capture the feeling of serenity and what it means to us as individuals. The ancient Greeks developed the concept of ataraxia, the absence of cares and freedom from worry. From Buddhism we get Passaddhi, serenity of the body, speech and thoughts on the path to enlightenment. More recently, Romantic poet William Wordsworth, (7 April 1770 – 23 April 1850) wrote that “poetry is the spontaneous overflow of powerful feelings: it takes its origin from emotion recollected in serenity”. We couldn’t have said it any better ourselves. Unfortunately, as modern people in our busy world, finding peaceful moments in which to reflect on life and wax poetic may be a little hard to find. There are meetings to go to, sales figures to hit and clients to impress – who has time for enlightenment? 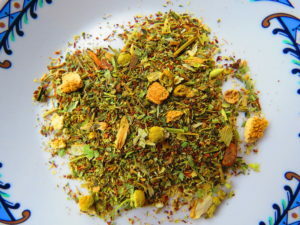 Thankfully, we’ve put together this sumptuous blend of calming herbs and spices to help you slow down, get grounded and enjoy the stillness of time and place for a few moments. The next time you’re feeling the pressure of daily life and need a little retreat, let the round herbaceous notes of Serenity take you on a personal journey of inner peace.